Originally from the UK, Jackie Wells lived and worked in Hong Kong before moving permanently to Melbourne thirteen years ago with her family. One of her dogs is, of course, a spotty dog, while the other is fat and stripy. She also keeps chickens. Jackie has always loved reading and writing rhymes. 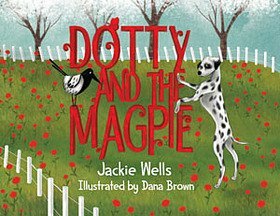 Dotty and the Magpie is her first book, which demands to be read aloud.